Put a fire-proof skillet over medium heat on campfire or grill, add butter, and when the butter sizzles, add the chicken, cooking until browned, stirring often. Dump the pineapple with the juice into the skillet, then add the brown sugar, stirring to combine. Slide skillet over to slower coals or turn grill down to low. Continue cooking over campfire until liquid gets thick and chicken is cooked through. In a separate skillet start warming your tortillas, removing as each one gets warm and setting aside, covered with foil to keep warm. 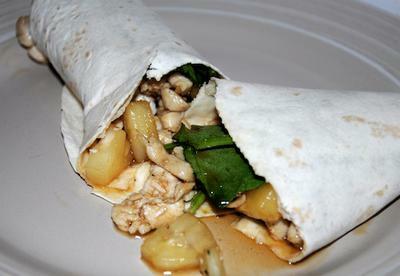 Serve chicken with pineapple sauce rolled up in tortillas to form wraps. 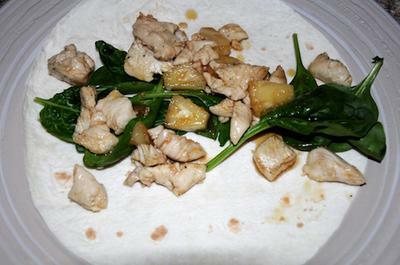 You can add other foods like lettuce to the wraps if desired. Adding more veggies will stretch the recipe to feed more. This will serve 4 to 6 people.